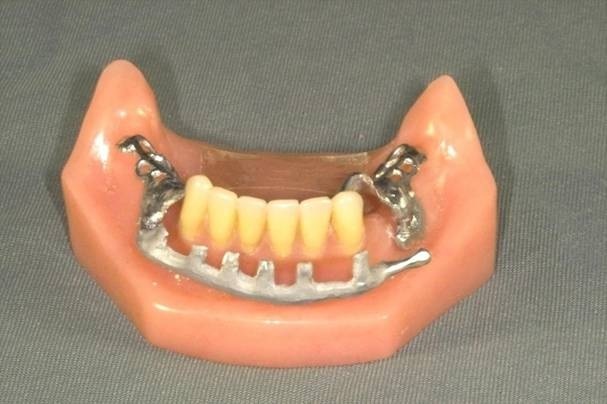 The swing-lock removable partial denture (SL), was introduced by Simmons in the early 1960s. 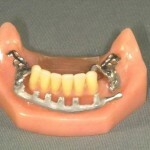 Swing lock partial dentures are designed for dental patients who have depleted dentition. They are sometimes used because traditional partial dentures can be unreliable due to rather limited bracing and clasping abilities. These limitations result in a weak resistance to rotational forces. To overcome this problem, the swing lock partial denture design makes it possible to clasp multiple teeth at a time, therefore increasing the bracing and reduce the rotational movements of the denture. However, it is infrequently used by clinicians because it is technique-sensitive, especially during hinge and lock fabrication, and the durability of the retentive element of the locking mechanism decreases with the progressive wear of the metal latch attachment. In addition there is questionable durability of retention of the snap-lock system, which decreases as the metal latch attachment wears from repeated opening and closing. Therefore, the conventional SL-RPD is also not generally accepted as an alternate treatment modality by dental educators. Only 54% of the American dental schools teach swing-lock procedure, and only 14% of the dental students will complete an SL-RPD before graduating. A new design for a swing-lock RPD by use of a vertical bar and plastic clip attachment as an alternative to the hinge and latch attachment. The suggested modification hi the locking mechanism may overcome some of the problems associated with the conventional swing-lock RPD. A Swing-Lock®-designed partial can stabilize mobile teeth and offer cosmetic enhancements. It can also add or repair facial contouring and work as a hidden clasp design partial where retaining struts are placed below or above the lip reflection lines. 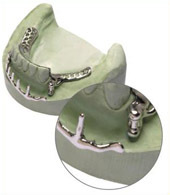 Swing-Lock partials are also used when there is very little undercut to clasp and they are very easy to add to in the future. This type of partial evenly distributes load among all supporting teeth, relieves the immediate stress on adjacent abutment teeth (as would occur with circumferential clasping), and passively engages all abutments during mastication. 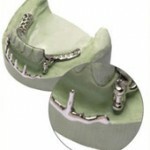 The typical Swing-Lock® partial utilizes a lingual plate with a labial bar connected by a hinge on one side and latch on the other. The labial bar and struts, working in conjunction with the lingual plate, lock in and hold the anterior teeth. In many cases, this partial design can actually strengthen the supporting distal abutments because it relieves stress. A Swing-Lock® design is also beneficial when a bite problem is causing pressure and migration of unsupported teeth, making splinting (stabilizing mobile teeth) necessary. The design allows you to even out the force over all the load bearing abutments, not just individual abutments. Also, locking the abutments in a stationary position can stabilize the root of the tooth. The following advantages result in much greater Comfort, Better Appearance, increased Chewing Ability, longer life of Swing-Lock® partials compared to all other types of removable partial dentures. Perfect retention – the denture cannot be accidentally dislodged, even while eating, talking, or sneezing. It must be unlocked by patient for it to be removed. I-Beam Effect – less lateral displacement of saddles will reduce the stress placed on the tissues, leading to less tissue resorbtion. It also has undeniably better stability than normal partial dentures. Swing-Lock® “Double-stress Cushioning” for abutment protection. Multiple abutments decrease each abutment’s load factor. Any abutment under load is supported by the appliance. Esthetic replacement of gingival tissues. Positive removable Periodontal splinting – enhances oral hygiene – makes home care easier. Cosmetic lip and facial recontouring where required. No critical abutments – unexpected tooth loss requires no major design changes. This leads to economical add-to ability as the denture can be redesigned and used again without having to fabricate a new denture. No unsightly clasp or metal display – struts can be placed on tooth gingivally to where clasps would be seen or a full labial gum tissue veneer can be used instead. (3) therapy for oncology patients who have undergone ablation surgery and have few remaining for example patients who have had a hemimaxillectomy mandibular resection. 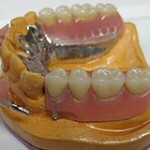 As with anything, there are some problems and limitations to having swing lock partial dentures. These problems include sometimes having problems open the mouth very wide, weak manual dexterity, bad oral hygiene and also having a very shallow sulcus (less than seven millimeters). 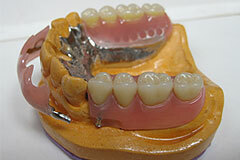 Swing lock partial dentures can also take a long time to build and can be extremely pricey.